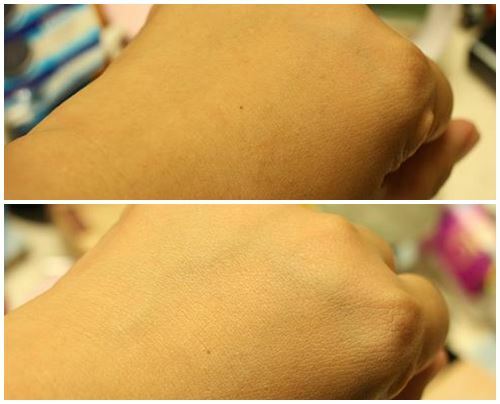 Goodbye BB Cream! Hello CC Cream! I finally bought a CC cream two weeks ago. I just ran out of pressed powder and I thought of buying another one, but when THE FACE SHOP had a sale I thought to just try one of their CC creams. 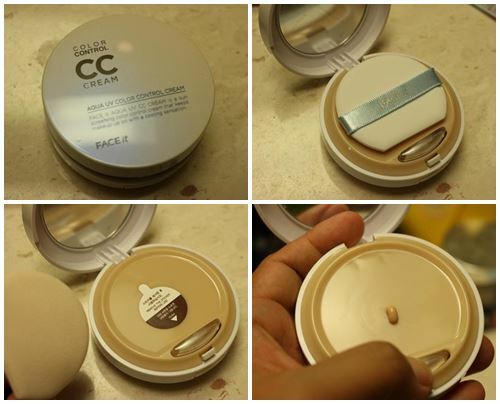 The CC in THE FACE SHOP’s CC cream stands for “color control”. The one I chose is the AQUA UV COLOR CONTROL CREAM. The saleslady said that it’s perfect for the summer because it has a cooling effect. There are two variants: 1 or Radiant Beige and 2 or Natural Beige. I took the “natural beige” and paid 14,450 won (13 USD) for it or 50% off the retail price. AQUA UV COLOR CONTROL CREAM is currently the number one bestseller among THE FACE SHOP’s makeup line. This is quite easy to apply. Just push the button on the pact to release a small amount of the cream. Use the sponge to pat the cream on the face. Don’t rub it! I only use a small amount for a light coverage. My favorite makeup is Chanel’s Vitalumiere, but it’s quite pricey so I guess I will just use the AQUA UV CC CREAM instead on ordinary days. I like that I don’t need to apply face powder using the Aqua UV CC cream.. And unlike BB cream, the CC cream does not leave my face with a gray cast. I’m not sure if it did last 12 hours but it does feel light on the skin and I like the no-makeup look it gives. The product look promising i will check with one of my friend to know more about cosmetic product as I have never purchased any cosmetic product online. I usually don’t wear makeup but I love using BB cream. It’s exciting to find out there is something even better. glad to have stumbled upon ur blog. will go to korea this coming november and shopping for make-up, skin care products, etc. will be one of my priorities that is why i love reading reviews about korean cosmetics. i am considering buying a cc cream and am deciding which korean brand is better based on what users’/bloggers’ say about the product. thanks!